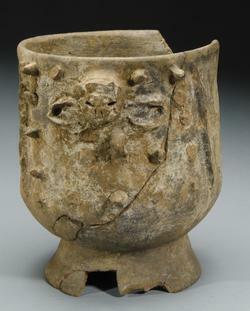 Look close – can you see the image of the spider monkey on this Maya incense burner? The Maya burned offerings of copal incense and perhaps offerings of rubber, blood, and other organic materials in containers like this, creating sweet-smelling smoke to rise up to the gods, bringing with it requests for rain, bountiful harvests, success in war and the general well being of the community. Why would a monkey be on such an important item? The Maya connected the spider monkey to world destruction, and its subsequent world renewal. You can never have enough monkeys on your side trying to make your world a better place! You can see, and learn, a lot more about Maya culture here at the Science Museum starting June 21 when the special exhibit “Maya: Hidden Worlds Revealed” goes on display. • Click here to see a variety of other incense burners – or censers – also collected from the highlands of Guatemala. • Click here to learn more about spider monkeys. • Click here to learn more about the new SMM exhibit “Maya: Hidden Worlds Revealed.